Rock your way into backyard relaxation with this set of two resin wicker rocking chairs from International Caravan. Crafted from durable PVC, steel and resin wicker, these chairs hold up well to the vagaries of outdoor weather. The rockers are UV resistant, so they don't fade in harsh sunlight. High camel backs look great and provide plenty of support while you rock with a friend on the porch or deck, and the open weave design ensures efficient ventilation. 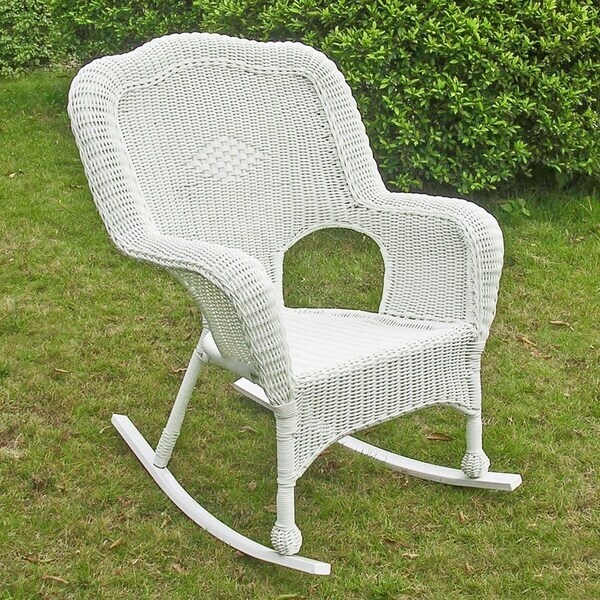 A wide seat and generous arms make each rocking chair even more comfortable, and you can use the rocker with or without a cushion. Dimensions 30.0 In. X 26.0 In. X 39.0 In. Not as thrilled with these as I thought I'd be. First of all, one of the rockers did not line up to the leg of one chair. Having no idea how I'd cope with shipping it back for exchange, my husband and I had to use a car jack and jury rig it to work sideways so we could force the misaligned leg into a different position so the rocker would fit on it. What an ordeal!!!!! Plus, these chairs are on a much smaller scale than what they look like in the picture. I wanted something quite a bit larger. I have cushy chair pads and backs on order, and when they are in place I am afraid the chairs will feel awfully small and crowded. Guess this is what I get for ordering on line. Won't do this again! I have just reduced my rating from three stars to two. The more I think about this the more disappointed I am with my purchase of these chairs. So Shoddy that the rocker did not fit the chair!! And so sorry the chairs are so small! Not happy! Back AGAIN to further reduce to 1 star! 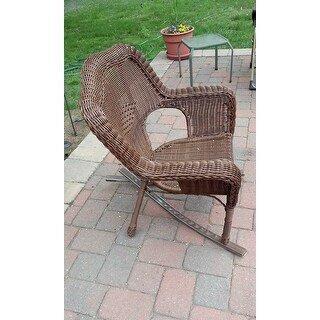 The faulty chair's rocker FELL OFF! WHAT JUNK! How does an old woman disassemble, package up and ship this back to China? I am too old for this! What a MESS! AND...IF I go through all that, THEY want to charge ME *** to return it!!! Do yourself a favor--DO NOT BUY!!!!! 6/14/18 Now I am back, again, to say that a rocker from the second chair has fallen off! LESSON LEARNED: DO NOT THROW OUT PACKAGING UNTIL YOU'VE HAD THE ITEM AND TESTED IT OUT FOR A GOOD LONG TIME. THESE WERE PURE JUNK! CAN I GIVE IT ZERO STARS? This is a quality chair that is perfect for outdoor use. It arrived on time and only required easy assembly. I would recommend this to friends and family. These rocking chairs look wonderful on my porch. We love them. Glad to have purchased these chairs! After much searching, we are glad we purchased these chairs. They are both attractive and comfortable. If you put seat cushions on them, note that those have a tendency to slide forward while you're rocking. We really like the way they look, and they add a lot of charm to a porch or deck. Very minimal assembly. We have had them for about 4.5 months, and they have held up well so far. Especially for the price, they were the nicest, sturdiest rockers we found, and we are glad we bought them. I love these! I had been spray painting old wicker chairs for my front porch for the past yrs. and finally decided to purchase these....I love the sturdiness of them and appreciate the fact that since they're not "real" wicker, they are maintenance free! I fit nice and snugly in them with the cushions that I also purchased from overstock :) Hubby said they were easy to assemble, as well. Very attractive! The runners that rock the chair are metal that is screwed into the bottom of the legs. The rocking action feels awkward and the screw rubs on the ground. 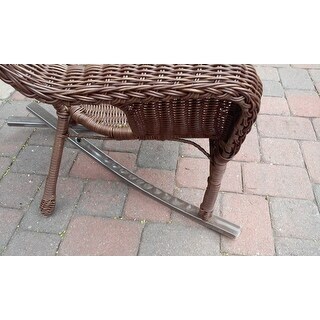 I could never use this rocker anywhere but outside on a surface that can take the screw. The chair itself is attractive and relatively comfortable while being short seated...more for women. Made in China.... what did I expect ...? Very happy with these rockers. Comfy size, nice quality. Like the size the most. Look great on my porch. Highly recommend if you want style and comfort in a rocker. I bought two of these to use on our upstairs balcony. Very comfortable with or without cushion seating. We love using them for morning coffee. Chairs great - shipping horrid! The product from Overstock is an excellent value. The chairs look great on the front porch. There was a bit of assembly required to put the rockers on the legs. Packaging was fine and the chairs arrived at the house in great condition. Chairs are beautiful and comfortable. Easy to assemble, quick delivery. These were smaller than I expected and not quite as elegant. Very easy to put together, although one of the rockers was slightly bent. They look nice on my balcony. This product is not a very high and cheer. I was hoping for a tiger in private like I had. The picture looks much better than what it actually arrived. Cute little rockers. Easy to put together. It has a little more interesting form than some others I looked at. Seems to be made of good quality. Perfect addition to my front porch. Very durable and comfortable... Love them. Great chairs. Very comfortable. Arrived on time. Love these chairs! Great quality and super easy to put the feet on! Would highly recommend! "What is the weight limit of each chair?" Hello jdixonk03, the weight capacity is approximately 300 pounds. Please let us know if you have additional questions. Thanks for shopping with us. house warming gift for my daughter. perfect for her southern front porch! "What kind of assembly is required?" Hello duckgumbo7, the assembly is very easy, you just need to attach the rockers to the chair. Thank you for shopping with us. Just have to attach the rockers. Easy peasy!! "is that weight of 38 lbs each chair or the pair?" Hello christineener, each chair is 38 pounds. Have a great day! "Does it come with a warranty?" Hello tomslonneger, yes this comes with a 90 day Manufacturer warranty. Have a great day!